Why fly to New Zealand when you can have all the benefits here in NSW. Clean fresh air and automatic altitude training at your back door (for bigger lungs and better oxygen conversion). The property is located near the highest city in Australia and is ideal for the raising of horses as there is little to no risk of ticks, bats, itches, mosquitoes, sand colic etc, as well as no neighbouring mines. The added benefit is these horses are bred to be tough; having to deal with extreme season changes, and some harder ground creating better bone density. No short cuts are taken in their raising, care and nutrition. Horses receive two well balanced hard feeds a day, customised for the individual. 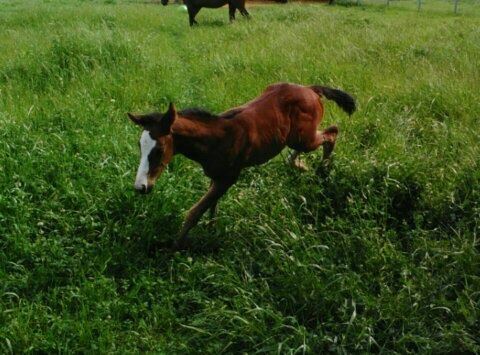 Babies are rugged from the moment they can stand and all horses are rugged through out the colder months. Personal care and attention to detail is what sets Clarke & Croft Bloodstock apart. Lot 82 Inglis Classic Sale 2019. Vancouver filly by the Lonhro mare Flash of Innocence to be sold in the Gold Session (also excepted into MM1-4). She is a compact, neat, 2yo type who has an outstanding swinging walk (that doesn't just over-track very well but really reaches from the shoulder). Her paddock movement reflects this walk with a surprisingly ground covering gallop stride. Her dam page is absolutely riddled with 2yo winners and she is sired by a Golden Slipper winner. The pretty head completes the package! Has been an absolute pleasure to prep, extremely sensible and easy in every way, has a great work ethic, a true professional. Lot 604 Inglis Classic Sale 2019. Star Witness filly out of More Than Ready mare Poetess. Aren't MTR mares kicking goals at the moment?! A great type with natural muscle definition, correct, very tough white hooves (shod only for the sale), a great eater, relaxed in the stables (at home at least! ), smart, and loves to work. If it wasn't for her MTR head you could be forgiven for thinking you were looking at Star Witness himself! Indicates to us that she will be a very fast and tough racehorse!